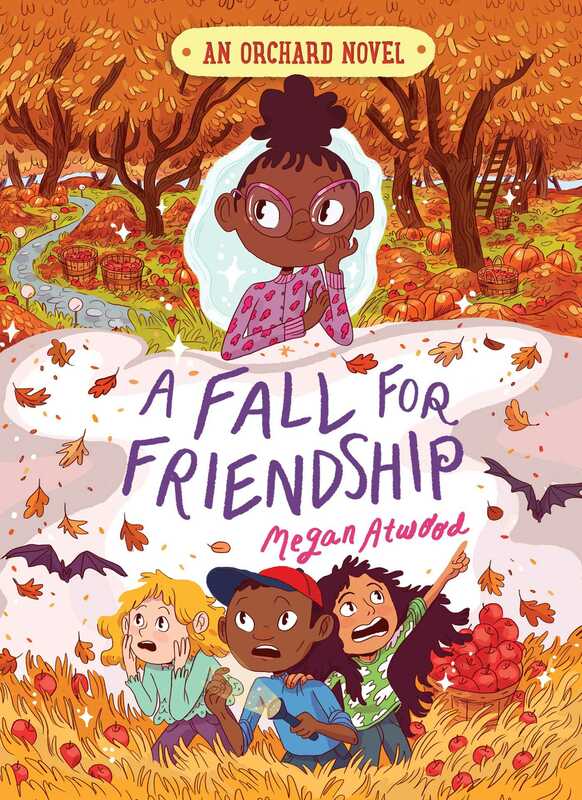 Olive doesn’t believe in ghosts, but something weird is definitely going on at the orchard and she wants to get to the bottom of it in this third novel of a sweet series about the bonds of friendship. Olive, Peter, Sarah, and Lizzie are getting ready for Halloween. This year, they’re planning a zombie hayride and a haunted barn party. As they set up, Lizzie’s older sister, Gloria tells them that a ghost haunts the very barn they’re decorating. According to Gloria, the ghost is angry and desperate for revenge. Lizzie, Sarah, and Peter are fascinated, but Olive doesn’t believe any of it. Not even when strange, ghostly things keep happening all around them. Olive sets out to prove that ghosts don’t exist and that Gloria and her friends are behind it all. But the more Olive investigates, the scarier things become. Could Gloria be telling the truth? Is the orchard really haunted? A Fall for Friendship CHAPTER 1 But . . . Is It REAL? Actually, no Halloween monsters REALLY exist,” Olive said, pushing up her glasses, then reaching over for more apple pie. “Zombies are a great example,” she went on. “Scientifically, zombies aren’t physically possible.” She piled her plate high with the pie and then added some ice cream. It wasn’t until she’d finished that she saw the whole table looking at her. Her dad John beamed, but her other dad, David, smiled and looked down, shaking his head a little. Lizzie’s parents—Albert and Tabitha Garrison—shared a smile too. But Olive’s twin brother, Peter, and their friends Lizzie and Sarah all just looked exasperated. Olive furrowed her eyebrows. “Yeah. Because there’s no such thing as ‘real’ zombies.” She wasn’t sure why Sarah wasn’t listening to her. Sure, zombies were something she and her brother had been obsessed with for years. . . . And when they’d moved to New Amity and met Lizzie and Sarah, they’d found out they loved zombies too. AND they all got to plan a zombie hayride for a fall activity at the Garrison Orchard—not to mention a haunted barn. But that didn’t make zombies real. Surely Sarah knew that? A smile broke out over Lizzie’s face—a smile that Olive couldn’t help returning, even if she was still kind of smarting from Sarah’s irritation with her. Lizzie’s smiles were always contagious. Plus, Olive was super-excited about the festivities. This was the first year the Garrison Orchard would be putting on the zombie hayride and the haunted barn. And she, Peter, Lizzie, and Sarah were right in the thick of it. It wasn’t just the four friends who were excited, either. The hayride and the haunted barn were the talk of everyone in their school. Kids were betting each other they wouldn’t go in, and Olive had even seen two kids crying because they were scared even at the mention of it. She thought that was silly. What was there to be scared of? It was just a bunch of kids Gloria’s age acting. None of it was real. Now, river parasites? THOSE were real. And something to be afraid of. Tabitha interrupted, “The paying guests,” but Gloria barely paused. Gloria huffed loudly. “BABIES need to wait their turns,” she said, and slammed herself backward against her chair. Lizzie’s face turned immediately regretful. “Oh, no. I interrupted you, didn’t I?” she said, her eyes worried and scrunched. Sarah patted her shoulder. Gloria ignored her and put her headphones on, apparently done with the story. Olive laughed. “Well, yeah . . . because there’s no such thing as a real ghost. . . .” But she noticed no one else was laughing. In fact, they looked a little annoyed with her. Sarah huffed. “You don’t KNOW there’s no such thing,” she said. Before Olive could answer, Peter said, “It sounds awesome, Lizzie. We are all so excited.” Lizzie beamed. Peter threw Olive a look. This time, Olive didn’t smile back. Why weren’t her friends listening to her? And why did they insist on saying things were real, when they KNEW they weren’t? Suddenly, she felt like one of the grown-ups instead of one of her friends. “DEAL!” yelled Sarah. She high-fived Lizzie on one side of her. And then Peter on the other. But she didn’t high-five Olive on the other side of Peter. Olive wanted to believe that she didn’t because she was too far away. But she had a feeling she was making that up.